Ram's new Multifunction tailgate further enhances the award winning 1500. In a press conference at the 2019 Chicago Auto Show, Fiat Chrysler Automobiles (FCA) had no shortage of announcements for its Ram Trucks division. Jim Morrison, Head of Ram Brand, made it clear that customers of the Ram 1500, Heavy Duty and commercial Chassis Cab have plenty to look forward to. At the forefront of the new models and features for 2019 is the brand's commitment to comfort, convenience, and class-leading capability across the lineup. In addition to the new Multifunction tailgate for the 1500, Ram debuted the 2019 Heavy Duty line and revealed a new luxury Limited trim for the Chassis Cab commercial lineup. 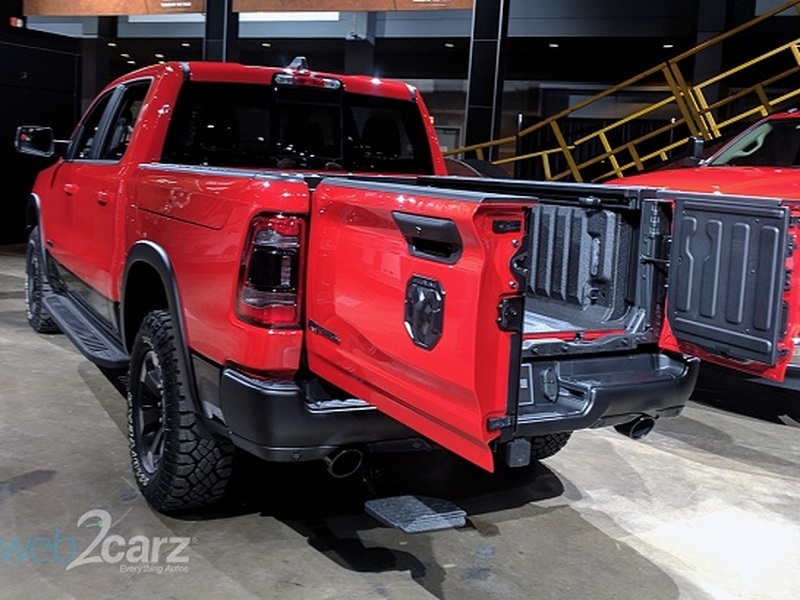 Ram's new and one-of-a-kind tailgate design was unveiled and demonstrated in Chicago to show off how it will add greater utility and convenience to the 2019 Ram 1500. In addition to keeping the open flat functionality, the 60-40 split swing-away tailgate will add three configurations. These include opening just the left door, the right door, or both together. Each door opens individually to 88 degrees even while hooked up to a trailer for added convenience. The benefits to Ram 1500 owners include improved cargo management, easier access to step up to load heavy or bulky items and simpler unloading and washout. The new configurations also allow for forklift loading. With competitors offering features like GMC's MultiPro Tailgate, Ram is making a clear statement that they can keep up and deserve to be on the podium in the pickup truck segment. The Ram 1500 is the most awarded half-ton pickup. The Multifunction tailgate will be available across all 2019 Ram 1500 models in the second quarter of 2019 for an additional $995 MSRP with an optional center step for $295. The Ram Heavy Duty Power Wagon is the most capable off-road truck across the segment. The capable Ram Heavy Duty line was front and center in Chicago. Ram's Heavy Duty (2500 and 3500) trucks have the highest payload and towing capacities among the competition. Now, thanks to a new Cummins I-6 Turbo Diesel engine, Ram has reached a maximum of 1000 lb-ft of torque to add to its list of accolades. The Ram Heavy Duty trucks have a class-leading towing capacity of 35,100 pounds and a payload capacity of 7,680 pounds. A Mopar modified 2019 Ram Heavy Duty unveiled at the Chicago Auto Show. Chicago also got a first look at a Mopar-customized 2019 Ram 2500 Heavy Duty pickup. The modification enhances the ruggedness of the 2500 Heavy Duty as it flaunts Mopar parts including a black Ram Bar in the bed, off-road LED lights, a rear bed step, off-road wheels, rock rails, and a spare tire carrier in the bed. An upscale Limited trim gives commercial truck customers a luxury upgrade. Rounding out Ram's announcements at the Chicago Auto Show was an introduction to its new commercial line of trucks including the Ram 3500, 4500 and 5500. For 2019, Ram Chassis Cab offers more capability, safety, tech, and luxury than ever before in the commercial truck segment. The Chassis Cab is designed to tackle the tough tasks thanks to a 6.4-liter HEMI V-8 with up to 410 horsepower and 429 lb.-ft. of torque. The truck has a segment-leading towing capacity of up to 35,220 pounds and payload of up to 12,510 pounds. Ram is boosting the comfort of the Chassis Cab for 2019 with a first-ever Limited trim which gives the commercial truck premium interior materials including real wood and real leather, plus the most advanced tech and safety features. The Chassis Cab offers the Uconnect 4C NAV with SiriusXM on a 12-inch touchscreen display and is the only truck in the commercial segment to offer adaptive cruise control, forward collision warning, and automatic emergency braking with trailer brakes.